At around 10:00 a.m. one quiet Sunday morning, I found myself in the middle of the medieval-style town square of the small Czech city of Kolin. Though a hub for trade, culture, and aristocracy in in its day, on that Sunday the town was silent, empty, and peaceful. My class had driven about an hour outside Prague to see the rich Jewish history that Kolin has preserved. In addition to being a trade hub and favorite city of Bohemian royalty, Kolin supported a robust Jewish population from as early as the 1400s all the way to World War II. The Jewish population lived mainly in a Jewish ghetto of about 52 houses. We stopped at three main sights on our walk around Kolin. The first sight was the local Church of St. Bartholomew, where we examined anti-Semitic carvings on the church’s interior pillars. Next, we visited the town’s synagogue built in the 1600s. Finally, my class visited the Jewish cemetery, dating back to the early 1400s, in which many prominent Czech Jewish figures are buried. The most striking part of the trip was our visit to the synagogue. Unlike the Church of St. Bartholomew, the synagogue was built low to the ground and hidden behind the walls of buildings in the Jewish ghetto. And while the church is visible from any point in the city, the synagogue is not even visible from the street in front of it. At the time of the synagogue’s construction, royal building codes prevented synagogues from being as tall or as beautiful as churches. 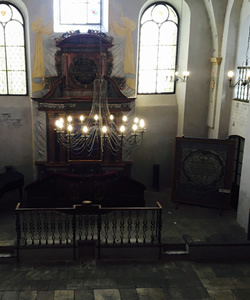 Once inside the synagogue, however, it was clear that the exquisite interior made up for the hidden exterior. Sunlight beamed through stained-glass windows over the ark, lighting walls decorated with pastel-colored vines, fruits, and Hebrew scriptures. Of all the things the synagogue included, however, it lacked one of the few main requirements of a working synagogue: the eternal light, the light above the ark in the center of the synagogue meant to be lit 24 hours a day to signify the consistent, unwavering presence of G-d. Without the light, the synagogue is not active. Her words echoed eerily off the peaceful walls. Kolin, what had once been a center for Jewish life, culture, and scholarship for hundreds of years, was gone. Feeling the absence of the community while sitting in their synagogue was chilling.The peaceful Jewish cemetery, the carefully constructed synagogue, and even a well-known Cubist Czech villa, commissioned and owned by a Jewish family before they perished in World War II, were all still standing and relatively unharmed, even though the populations that routinely inhabited them had all but vanished in the Holocaust. The few congregation members that were able to return at the end of the war were not enough to sustain Kolin’s Jewish community. Usually, when we think of memorializing atrocities—especially the Holocaust—we think of memorials focused on the dead. We think of names, numbers, and depictions of vicious murders rather than the laudable and unique lives the victims led before their deaths. But a few Sundays ago, I witnessed an almost unintentional Holocaust memorial simply by witnessing one Jewish community’s former home. The trip made me wonder about the best way to memorialize the Holocaust, and Jewish history in general. Of course, certain memorials such as Auschwitz are a necessary preservation of the death and brutality of the Holocaust and a constant never again reminder. But it was equally meaningful to memorialize victims of the Holocaust by focusing on the community’s life before they were brutally murdered. In seeing the gorgeous buildings and cultural history that Kolin’s Jewish community left behind, I was able to celebrate and revere the community, rather than concentrate on their bitter and gruesome end—the part of the story they themselves had no control over writing. The experience put a face to the names of a few Holocaust victims and provided a memorial focused on history the Jewish community created, rather than the history Hitler created. The experience was uplifting, even triumphant.